An administrator can either be a full administrator who can access everything in the server prefs, and all users, or you can delegate administration allowing a limited administrator to create and manage users in their group, and assign folders that they themselves have access to. There are two different checkboxes. One for "Everything" and one for "Limited". 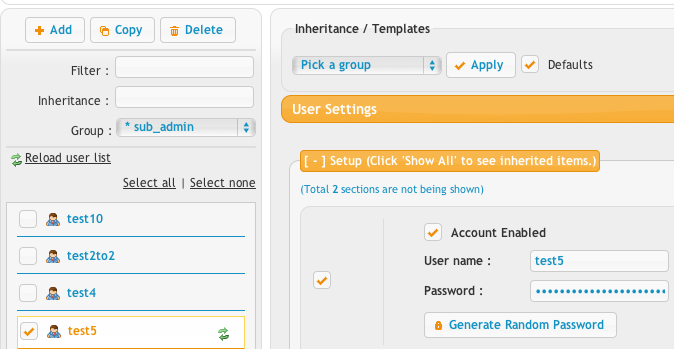 If you enable the "Limited" checkbox, the user who logs in to do remote admin will only get the user manager interface. The user manager will only contain a list of users who are part of a group that you granted this administrator access to. So if test3 is a limited admin, there must be a group named "sub_admin" in my example. The sub_admin group should not have test3 as a member, or else test3 can edit themselves. There must also be a user named "sub_admin" which has a VFS with the folders you want the admin to be able to work with. Security is enforced when the admin goes to save a change to a user. The server verifies any change the remote admin submits. 1.) If the user is not a member of the group, the change is rejected. 2.) If the home folders being specified are not a sub folder of the home directory that the group user can access, the change is rejected. 3.) If the change involves adding an event to a user that specifies a "plugin" action, the change is rejected. 4.) Other admin escalation permissions are denied too. These are done to enforce security and prevent privilege escalation. Any attempted violation of these is logged in the server log for audit purposes. 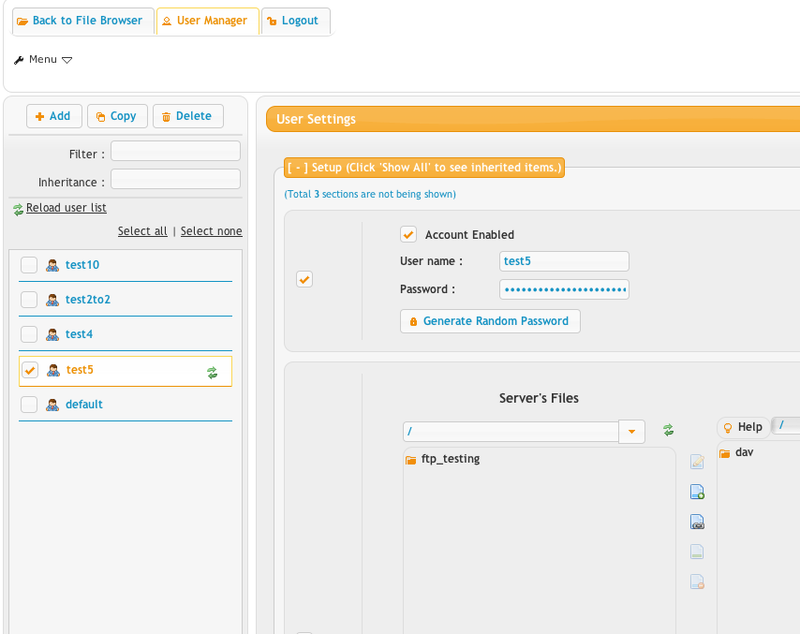 Finally the view from a limited admin when they login.